In this post i will finish IOT Home automation using Goggle assistant, Dialogflow and firebase which i started in previous post. Till now we are done with Hardware Setup, Connecting Arduino NodeMcu with Firebase & Setting Up/Configuring Dialogflow agent. So, let's complete left out part i.e. 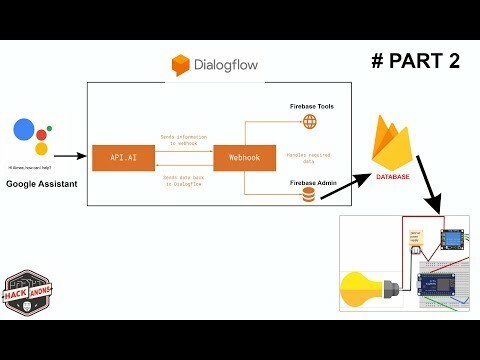 Configuring Firebase Tools for Webhook and Integrating Google Assistant with Dialogflow. Install Node.js and npm environment. Install firebase tools using npm. => Run firebase login to login via browser. above command will create directory which includes whole project files here we just need to focus on index.js file . once done with writing code just need to deploy code to firebase functions. Now, we are done with creating our chat bot which can control our lights, using firebase functions. Let's integrate our chatbot with google assistant so that we can easily control lights using our android device. Tip: Here i will suggest to use account which you are using in android device, so account google account should be same for : dialogflow, firebase, android. Now do general settings as directed in video tutorial and test your app on simulator. So, that's end for IOT with Firebase using Google Assistant, if you face any query feel free to comment out . Great post. Thanks for sharing it. Get the proper home automation courses of the IOT to learn the new technology in the proper way. This video is really informative on IOT technology. As, the IOT technology is emerging to provide the Smart home automation services in home to improve security in home. How to Build an App for the Google Assistant on Android Studio , please help me! How do I solve the problem as follows? You cannot use standard Google Assistant features in the Simulator. If you want to try them, use Google Assistant on your phone or other compatible devices. I had a power cut and had to re-set everything, but solved this by putting in 3xAAA batteries. Would I recommend the lamp? Yes, it works well. £30 is still hefty for an Alarm but I think it's worth it considering how expensive competitors are.